This April, TIS celebrates our two-year anniversary of becoming an official certified B Corp! We just wrapped up the re-certification process, which occurs every two years, and asks companies to establish goals and areas for improvement. This component, in addition to the preparation process in its entirety, got us thinking—why not create a report that compiles this information to keep ourselves accountable to our goals? So we did! About a year ago, TIS was approached by a group of students at Aquinas College who were interested in learning more about our business practices and the B Corp certification process for a class project, in which they were tasked to create a Sustainability Report for a local Grand Rapids organization. A few of their students came into TIS and chatted with us for feedback on workplace culture, practices, goals, and specific measurements we've tracked to attain B Corp status. With this information, the group compiled and presented their own version of a TIS Sustainability Report, which became the starting point for creating TIS Life: The Image Shoppe's First-Ever Sustainability Report! Special thanks to Nat and Lissa for their help in getting this report completed! 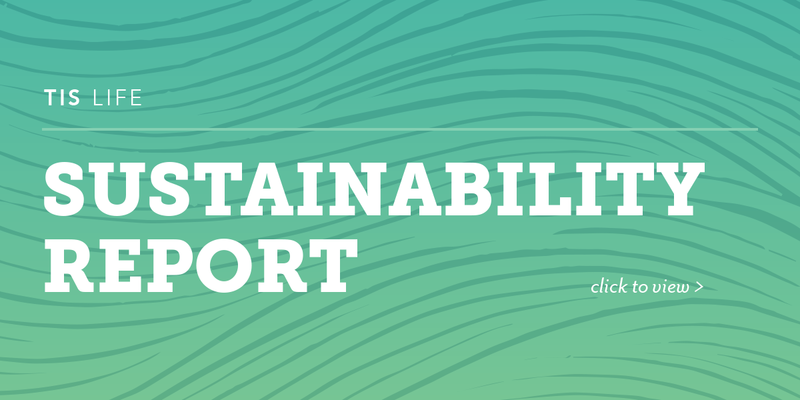 The TIS Life Sustainability Report covers each section of the B Corp assessment—environment, workers, customers, community, and governance—and then some. Each section includes what we're currently doing in these areas, as well as goals for improvement. These data sets are for the 2017 calendar year. 90% of our waste is diverted from the landfill. 100% of TIS employees take advantage of the healthcare plan provided by TIS which covers 85% of all healthcare costs. TIS is formally committed to donating the equivalent of 5% or more of our time through pro-bono branding and marketing work for organizations like Well House, GreenMichigan.org, New City Neighbors, Equity PAC, Local First, Dollars for Dylan, Start Garden, and ELO Network, among several others. Hold us accountable; download TIS Life! Believe it or not, even certified B Corps need accountability. For us to fully commit to our sustainability goals, we'll need folks like you to help us stay on track for improving our practices every day. Click below to download TIS Life: The Image Shoppe's Sustainability Report and let us know if you have any questions, comments or feedback via email: kt@theimageshoppe.com.